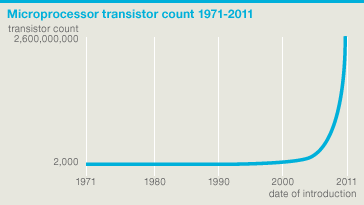 Moore’s law states that the number of transistors on a microchip will appromixately double every two years. Essentially space doubles every two years, which many then equate to a fractionating of storage price every couple of years. For example, think about 5 years ago… how much would an 8gb USB drive cost (did it even exist?). 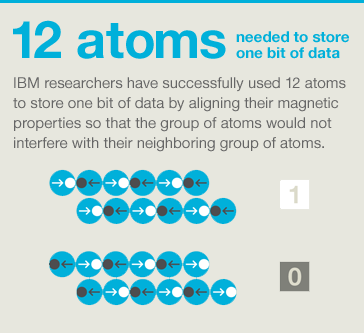 The challenge of Moore’s Law that IBM was facing is that we are actually nearing our limits with the current data storage methods, and therefore the technology would most likely soon default on this law. I read a book written by Mike Davis called the Planet of the Slums. I bring this up due to the discussion of the future city presented in class. There are many statistics in this book of population and how cities are growing tremendously in population size every day. I share this with you because this book states how the majority of individuals will end up living in cities in the future. The stat for this I believe was somewhere around 75% of the population will live in major city by 2025. This brings up an interesting point for how architecture will evolve and change because of this. For example Tadao Ando and his tight housing developments. I guess it just brings up an interesting point of space use( agriculture/farming, green space) especially with stats stating elsewhere that a high rise’s life expectancy is around 35-40 years. Really interesting article on the idea that maybe finding aliens may not be a good thing (Columbus(Aliens) coming to America(Earth)) and the idea came from Stephen Hawking. I have always wondered what alien life will be like and it is nice to know that I am not the only one who worries that the aliens might not be as nice as we think they will be.